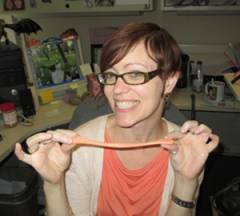 You thought I was kidding about the Silly Putty! Every few months, I have to get a fresh egg of the stuff. I’m a fidgeter. I wiggle around a lot, I tap my feet, and I play with Silly Putty at my desk. I hop up immediately to get every document I print. Every. Single. One. It’s unfortunate that I have a squeaky desk chair, because I’m probably causing my serenity-loving work space neighbors to tear at their hair and gnash their teeth. More and more, sitting times in classrooms are increasing, putting children that need to move at a disadvantage. Check out “Why So Many Kids Can’t Sit Still in School Today” at The Washington Post blog. How do you incorporate movement into your daily school routine? When we are at circle and the kiddos are antsy and can’t sit still its my cue to let them move. I have them make human letters. They love it. I generally start start out out with all the kids making a letter. But then I will have 2 or 3 at a time make a letter. We got some really cool pictures of them making letters by standing on a chair. We end up using the whole class. It really enforces the letter and gets the kids moving and learning. Marlene I do a newsletter monthly. I start by using my lesson plans. create a calendar and then just chat it up and expand on whats happening in the classes and what the kids are learning. I incorporate learning zones into my 4th grade math class….every student changes zones every 20 minutes…..one of those zones is my small group teach, and allows me one-on-one time with each student each day!